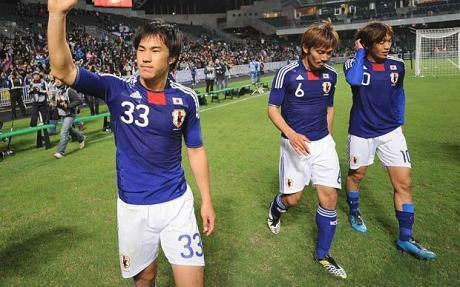 So far it's been a tough run for the Blue Samurai in this year's 2010 FIFA World Cup. Japan's national team led by coach Takeshi Okada will be taking on the Cameroon in the next Group E match this June 14th that will hopefully keep the underdog team in the tournament. So far. it has not been going so well but don't count them out just yet. Inspired by South Korea's recent 2-0 win over Greece, coach Okada is hoping to use South Korea's strategy of rapid passing as a blueprint for success in thier next upcoming matches. We would like to wish Shunsuke Nakamura , Keisuke Honda, Makoto Hasebe, and Brazillian born Marcus Tulio Tanaka and the rest of the Blue Samurai much success. がんばて ください! Hai! So desu! Blue Samurai Gambatte Kudasai!!! Unfortunately I don't think they will do too well. I think people in Japan are going to be unhappy, even more so seeing how well South Korea is doing. Oh I agree. I'm being realistic about thier chances. I know they are not Germany or Brazil but I wish them luck as I do to my other sentimental favorites and heavy contenders. I saw the game yesterday and was impressed. Japan was very organized and played as a team. This was an upset in my opinion. Cameroon looked lost. African teams can be deadly, but also horrible. Japan deserved to win and congrats. Saturday's match against the Netherlands will be tough but then again I feel Honda and the boys are up for the challange. I wish Japan the best!